Light blue, green and white mother of pearl shell makes the perfect necklace for the summer months. Larger necklaces in natural materials like gemstones can admittedly be heavy. If you prefer your necklaces lighter but still want to use natural materials, mother of pearl shell can be the perfect choice. 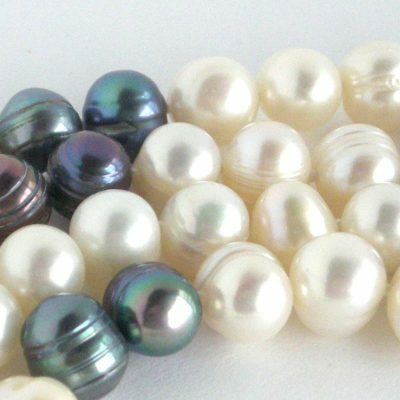 Once upon a time, the mother of pearl shell, was used for precious little buttons, but as that no longer is the fashion, the shells that have produced wonderful pearls – freshwater and saltwater, can still be utilised and we get to appreciate their lustre and sheen. This necklace gives you style, colour and comfort and is one of a kind. 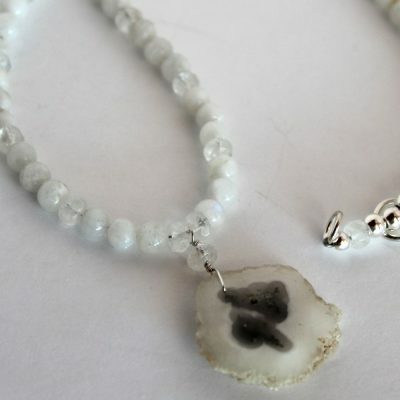 The mother of pearl shell has been treated and is accented with a few white freshwater cultured pearls and has a sterling silver clasp, although as a long necklace, just pop it over your head to put it on.